ONE OF INDIA’S foremost theatre makers and ad gurus, Alyque Padamsee has passed away today aged 90. Condolences have been offered by the President and Prime Minister of India and other personalities in the media and entertainment industry. He was one of my favourite people to meet whenever I went to Bombay/Mumbai and I was lucky enough to meet in June of this year, when I was in India and he invited me to join him for lunch at the Bombay Gymkhana (also commonly referred to as Bombay Gym). I found him extremely encouraging and supportive to an ‘NRI Indian’ like myself who is involved in theatre, especially when I told him about my attempts to create a South Asian performance canon in the UK and my play readings, ‘Retracing Our Footsteps’ at the Royal Court. He invited his son, Quasar Padamsee (who also runs his own company, QTP) – and we were later joined by actor, Nizwar Karanj – and over a fine lunch with me stuffing myself with carbohydrates and Alyque delicately enjoying his soup, we talked about English language theatre in India and the UK. Alyque (I always addressed him by his first name), was one of the early pioneers who directed and produced English language theatre in India. He fell in love with the stage at an early age was a tenacious and committed director. He staged Tim Rice and Andrew Lloyd Webber’s ‘Jesus Christ Superstar’ in 1974 with an Indian cast and live music on stage. 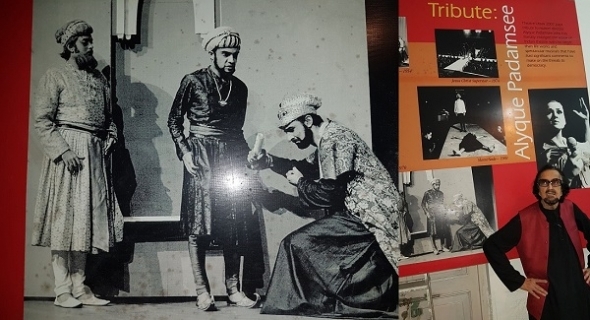 It ran every weekend for year in Bombay (shows are only on at weekends) and you can read about how awesome the show was here. Alyque also unearthed the talents of many people such as actor Kabir Bedi whom he cast in the English language version of ‘Tughlaq’ (by Girish Karnad) and who later also appeared in his ‘Othello’ (alongside Nikki Bedi who played Desdemona and later the two were wed). Acclaimed independent filmmaker Shyam Benegal, began at the same ad agency, Lintas, as Alyque; and choreographer, Shaimak Davar who appeared in Alyque’s rock musical, ‘Evita’ (1983) that also featured singer Sharon Prabakhar in the lead – who also became his wife. Sometime in 1999, I held a play reading of ‘Begum Sumroo’ (a play he staged in India in 1997/8 and was written by British playwright Partap Sharma) at Watermans Arts Centre in West London, with Alyque directing in the vain hope of getting the show produced in the UK and generating a cultural dialogue between Indian and South Asian theatre makers. In his advertising work as Chief Executive of Lintas, India until 1994 – he did some great adverts – such as the Kama Sutra Condom in 1991 featuring Pooja Bedi and ‘Liril Girl’ – a lime soap product made by Hindustan Lever, showing a young woman under a waterfall. He later formed his own company, AP Advertising which undertook image consultancy for brands and individuals and he wrote the seminal book, ‘A Double Life: My Exciting Years in Theatre and Advertising’ (published by Penguin India 1999). In his personal life, he had three wives. He was first married to stage actress and director Pearl Padamsee (with whom he had a daughter, Raell Padamsee). Raell runs ACE productions, a theatre company which produced ‘Broken Images’ (adapted from the Kannada play, ‘Odakalu Bimba’ by Girish Karnad and directed by Alyque, featuring Shabana Azmi). The couple divorced and he had a relationship with Dolly Thakore (another dynamic theatre personality and casting director). She was also the casting director for Richard Attenborough’s ‘Gandhi’ (1982) and Alyque played the role of Jinnah in the film. The couple have a son together, Quasar Padamsee who is one of the most sought after theatre producers in India. His final relationship was with the singer, Sharon Prabakhar and they had a daughter, Shazahn, an actress and model who appeared in several films including ‘Rocket Singh: Salesman of the Year’ (2009) and ‘Housefull 2’ (2012). Alyque was awarded the Padma Shri in 2000 & Sangeet Natak Akademi Tagore Ratna in 2012, whilst the Adversting Club of Mumbai named him the ‘Advertising Man of the Century’. Saddened to hear of the passing of Ad Guru and Theatre doyen #AlyquePadamsee. He gave me my first break in Theatre, like countless before and after me. There will never be another….#RIP Alyque.